Length: 538mm. Image shows assembled and painted kit. ?Transmitter, battery pack and charger are included for Japan market only. 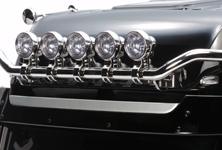 ?If lighting up cab roof or bumper auxiliary light pods, separately sold LEDs and some body modifications are required. 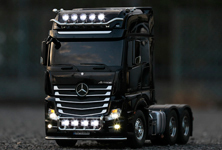 The 2012 Truck of the Year award-winning Actros series is the flagship of the world's leading truck manufacturer, Daimler AG (Germany). 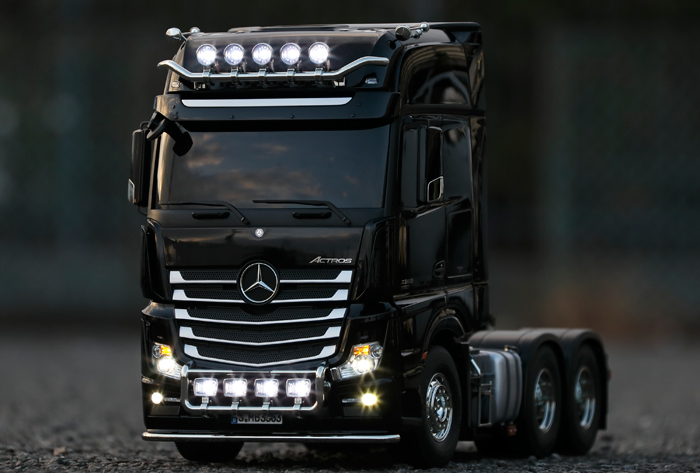 This R/C model assembly kit recreates the dual rear axle-driven Actros 3363 6x4 GigaSpace model, which runs on a 15.6-liter turbocharged inline-6 engine capable of 630hp. The model's highly detailed body breathtakingly captures the powerful form of the truck, including depictions of auxiliary lights on cab roof and bumper. Its ladder frame chassis features aluminum side channels with resin cross members, while the suspension employs leaf springs and friction dampers. 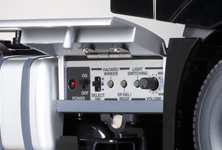 An assembly type 3-speed transmission allows gear changes via separately available 4-channel transmitter. ?4 Auxiliary light pods on the model bumper give a cool customized look, and can be lit up using separately sold LEDs. 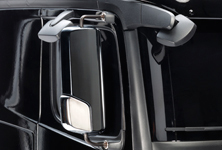 ?2-part side mirrors feature durable and realistic metal stays, and allow angle adjustment. Model also has kerb mirrors. ?The cab roof features five auxiliary light pods, affixed by a gleaming metal-plated stay. Light them up using separately sold LEDs. ?Tamiya models are renowned for their realism - check out the photo-etched stainless steel parts used to recreate platform areas behind the cab. ?This model is compatible with Tamiya Multi-Function Control Units, which can be safely stored out of sight in the catalytic converter box. 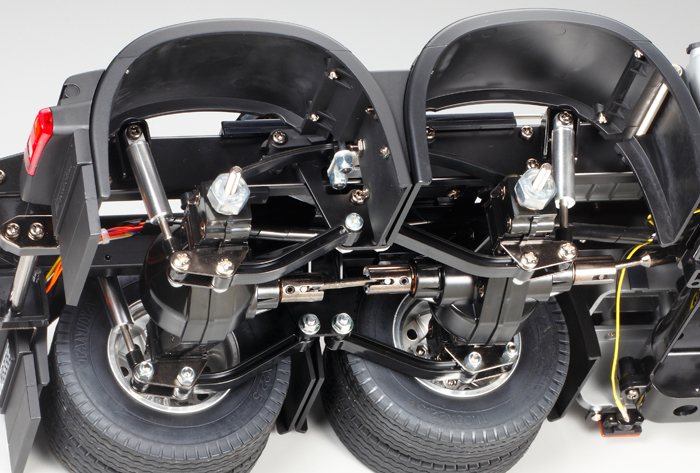 ?Realistic driving performance comes courtesy of its rugged suspension, reinforced resin floating axles working in tandem with metal leaf springs. 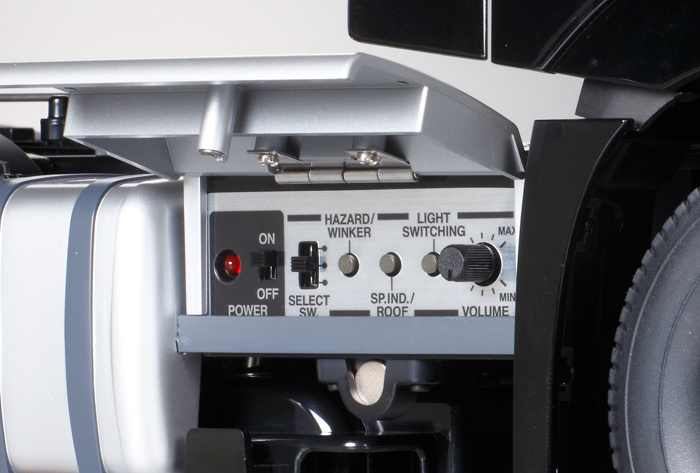 Tamiya Multi-Function Control Units (included for Japanese market only, available separately overseas) offer light, sound, and vibration operation to accompany your R/C truck experience. 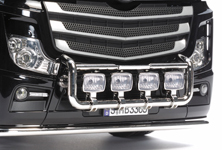 Engine sounds have been digitally recorded from an actual truck, and together with air horn, gear shifting, and many other realistic sounds, give you the feeling that you are driving the real thing! Headlights, brake lights, fog lamp, hazard lights and turn signal operations are also at your fingertips. ?Length: 538mm, Width: 195mm, Height: 305mm, Weight (without optional parts): Approx. 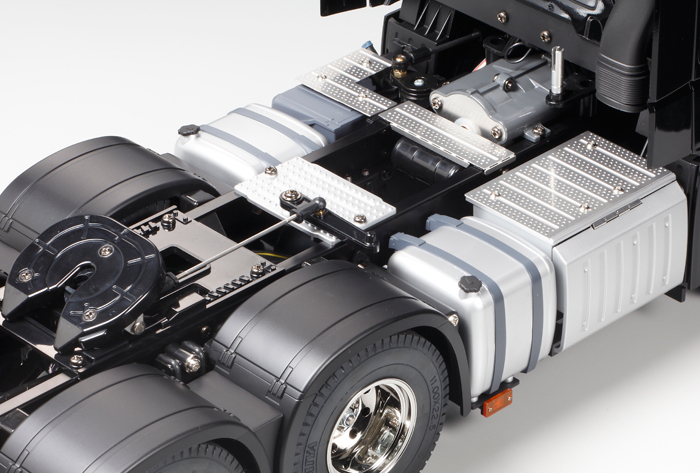 3.9kg ?Wheelbase: 237+103mm ?Tread: 155mm (Front), 138mm (Rear, Double Tire) ?Chassis: Aluminum & Polycarbonate Resin Ladder Frame ?Suspension: Front/Rear Leaf Springs ?Caster Angle (Front/Rear): 0°/0° ?Camber Angle (Front/Rear): 0°?Toe Angle: 0°(Front & Rear) ?Dampers: Aluminum Dummy Dampers (Front & Rear) ?Drivetrain: Rear Double Axle Drive ?Transmission: 3-gear transmission (gear shifting operated via transmitter) ?Gear Ratio: (1st Gear) 32.49:1, (2nd Gear) 17.76:1, (3rd Gear) 10.66:1 ?Diff. Gear: 3-bevel diff ?Motor: Type 540 ?Tire Width/Diameter: 30mm/85mm (Front), 22mm/83mm (Rear) ?Included Items (Japan only): 4-channel transmitter & receiver, MFC-03, 2 servos, 7.2V battery pack & charger ?Requires four R6/AA/UM3 batteries for transmitter (sold separately). Various types including semi-trailer, tank-trailer, and pole-trailer, are currently available. Attach any one of them via the coupler on the model to create an exciting combination over a meter in length. The information on this page is current as of March 16, 2016. Specifications are subject to change without notice.